I have such a fond memory of the days of video stores. Video stores. Before DVDs. They had a smell to them akin to bookstores. The tapes were big and bulky and made a pile in the front seat of your car. You had something substantial there you had to attend to. You had an entire weekend. 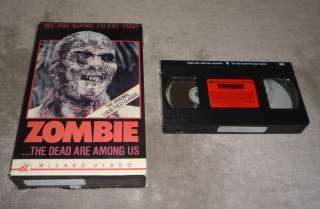 In the early days video tapes cost a fortune. A run of the mill tape might cost the store 75 dollars and more. That seems ridiculous to us now, but the medium was new. The only way to watch movies at home previous to that was either on a television or with a movie projector. What a novel and welcome advancement the video tape was. Charles Band was one of the earlier pioneers of making previously distributed movies available to video stores. He founded Wizard Video in 1981 to distribute cult films to a broader market. I was that market. At least I was later without really realizing it. What really put Wizard Video over the top was the big box format they developed in 1984.